Over the past several years, Pandora has built up 100 million users, changed how we think about the concept of Internet radio and even gone through an initial public offering, all without ever doing a major redesign or refresh to the Pandora site. That moment has finally come. 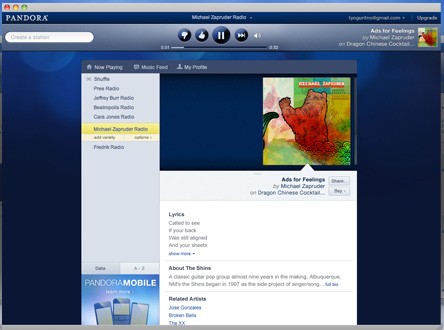 Pandora is set to undergo a total transformation that will add new features, ditch Flash for a snappier HTML5 design and be more usable, according to the company and some early reports. Pandora has grown to become ubiquitous on numerous devices, from set-top boxes and car dashboards to smartphones, tablets and even alarm clocks. It claims 100 million registered users, 36 million active monthly users and about 3.6 percent of the radio listeners in the United States. Yet, by other measures, Pandora is a failure. The company has never turned an annual profit, and its much-hyped stock offering has languished since the IPO, unlike the 150 percent gains seen in LinkedIn's stock price. Pandora's business model has yet to gain solid footing, while smaller competitors like Rhapsody, Rdio and Mog offer everything Pandora does as well as music on demand. And let's not forget the huge elephant in the room -- the impending debut of Apple's iCloud service. That's not to say that Pandora is going away anytime soon, but rather an illustration of the environment that forced it to do something - anything -- to keep up, and a redesign was the most obvious place to start. Getting rid of Flash will make the site faster and more easily integrated with today's Web via HTML5. The aesthetics of the redesigned site are truly beautiful but manage to retain a familiar feel. Controlling the current site through the Flash interface can sometimes be clunky, and certain buttons seem to move or disappear depending where you are on the service. Pandora says it's taking care of that by making sure the familiar player controls and thumbs up/thumbs down icons are always within reach. Search also stands to be improved, but perhaps the biggest change is the full integration of a social aspect into the service. Pandora is calling it the Music Feed, and it will function as a more full-featured social network to share and comment with friends within Pandora, similar to what is currently found in Rdio. I was an early adopter of Pandora, but since discovering and signing up for Rdio, I haven't opened the site or Android app. I'll be sure to visit once the new Pandora is fully implemented, but Pandora is going to need to ramp up its offerings aggressively to win me and many others back. Rdio and Mog offer as much as 10 times the number of tracks in their database as Pandora's and the ability to hear what you want on demand. For that service, I'm not only willing to forget Pandora, I've also got no problem shelling out a few bucks a month for it. The good news for Pandora is that I may be in the minority, as Rdio and Mog are still tiny services and Rhapsody doesn't have the same name recognition either. For now, Pandora is still operating from a position of strength with its millions of users, a recognized name and presence on just about every kind of device capable of playing music. This much-needed redesign is the first step toward staying strong, but Pandora will need to continue bulking up to stay in the game for the long haul. The New Pandora is already being rolled out to Pandora One subscribers and will be available to everyone else in coming weeks.